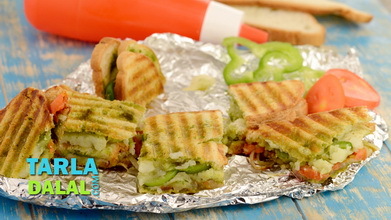 A filling of sautéed vegetables flavoured with tomato, chilli sauce and cheese the sumptuous cheesy onion grilled sandwich is an ideal breakfast offering. Heat the butter in a broad non-stick pan, add the spring onion whites and green chillies and sauté on a medium flame for 1 to 2 minutes. Add the cabbage, carrot and spring onion greens and sauté on a medium flame for 1 minute. Add the chilli sauce, tomato ketchup and salt, mix well and cook on a medium flame for 1 minute. Add the cheese, switch off the flame and mix well till the cheese melts. Allow it to cool slightly and divide the filling into 4 equal portions and keep aside. 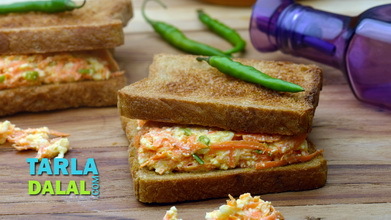 To make to make cheesy onion grilled sandwich, place 2 whole wheat bread slices on a clean, dry surface and apply ½ tsp butter on each slice. 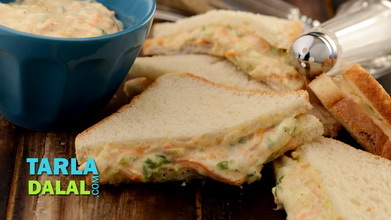 Spread 1 portion of the prepared filling evenly on one bread slice. 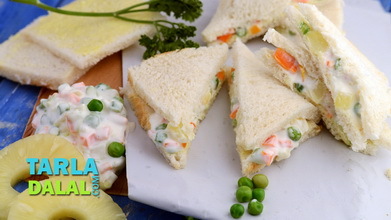 Place the other bread slice, buttered side down, over the filling. 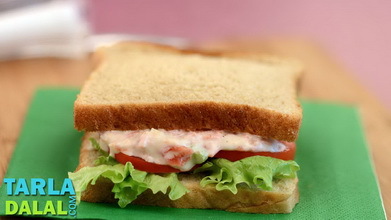 Brush ½ tsp butter on top of the bread and grill in a greased pre-heated sandwich griller for 5 to 7 minutes or till it turn crispy and brown from both the sides. 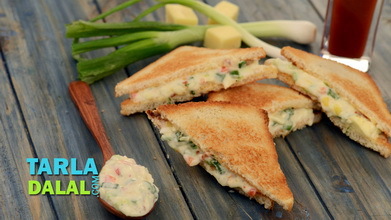 Cut the cheesy onion grilled sandwich diagonally into 2 equal pieces. 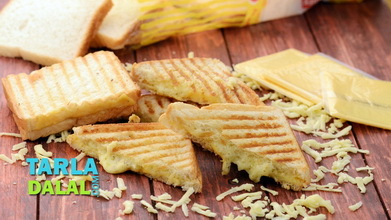 Repeat steps 1 to 5 to make 3 more cheesy onion grilled sandwiches. 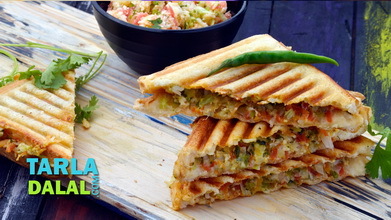 Serve the cheesy onion grilled sandwich immediately with tomato ketchup.